My hometown is known for its 3 rivers. Cedar log rafting on white water is dirt cheap, and extremely dangerous, but one early spring in the 1960’s 2 teenagers from Derby, Maine and I decided to give it a try. My brother, a best friend, and I took the notion to abandon the calm water of the Sebec River for a wild rafting adventure. It was an annual ritual to build replacement rafts because any from the year before were long gone. About a mile downstream from the old swimming hole, the Sebec converges with the Piscataquis River. From near the mouth of the Piscataquis and all the way upstream just beyond the iron bridge, huge rocks meant the rapids were especially wild during the spring thaw. 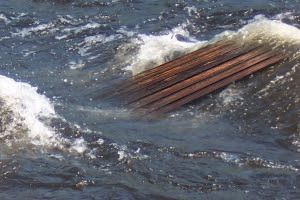 The plan was to build a cedar log raft a mile up the Piscataquis, ride the rapids, and then take the raft up the Sebec and tie her up or set an anchor near the old swimming hole Down Back. We spent 2 days and built a beauty of a raft around 6 feet wide and 15 feet long from cedar logs. Our brave trio returned the third day and launched her into the calm and frigid water. It wasn’t said, but we knew it. Fall off and death was nearly certain. For 15 minutes the ride was smooth and relaxing, and then about a quarter mile from the rapids, we held a meeting and decided to go ashore and drop off the friend. I believe he volunteered. The extra elbow room probably saved 1 or 2 lives. Excitement and adrenalin shot skyhigh as we neared the rapids standing up, and then we hit ’em. Immediately, I mean instantly, the poles were ripped from our hands as they caught between rocks, and we rushed along helplessly out of control. Within minutes we smashed into a huge rock (one that I know personally), and stuck solid with the backend facing upstream while waves of water rushed around each side. Fortunately, enough of the rock was above the surface to hold both of us, so we climbed off and pushed at the raft to cut her loose. Next, the physical laws of nature took over as the strong current whipped the raft to the right and around the rock, and she was off and running. I gotta credit my brother for quick thinking because he jumped on the raft as it spun by while I stood abandoned on the big rock (that one I know personally). Instinct kicked in, and I jumped. I missed. Half way anyway. My chest barely made the edge of the backend of the raft with most of me in the water. Grabbing me by the back of my jacket, my brother dragged me aboard. The balance of the ride was without incident, except without poles our only choice was to tear off part of the raft to paddle up the Sebec and out of the rushing current. It was a struggle getting 100 feet upstream considering we were shivering wet and ice cold with chattering teeth. Eventually we succeeded and about 20 minutes later we tied the raft to shore just as our friend arrived. The trek to the old swimming hole would have to wait another day. P.S. That rock that I knew personally was 9 feet high and usually standing in a foot of water by the end of summer. I’ve climbed and jumped from it many times before and since, so I know the water was 8 feet deep when I made the leap of my life.